Supported file types: STL (bin, ascii), OBJ (including texture support), STP, IGES (STP and IGES models get converted to STL), ZIP. Can arrange multiple STL models from a ZIP file. Infill calculation (Optional, monthly or an annual subscription is required). Support material calculation (Optional, monthly or an annual subscription is required). Ability to add predefined models to products. Model scaling (can scale axis independently). Model position optimization (automatically rotates the model to optimize the 3D printing process). Configurable printers, materials and coatings. Large file upload support (upload chunking). Customizable pricing: can be configured to charge per model weight, material volume, bounding box volume or per hour (monthly or an annual subscription is required for charging per hour). Different price rates for different amount of material/volume. Ability to get a quote by email (email contains Buy Now link). Wordpress 3D Printing product with enabled Checkout option. 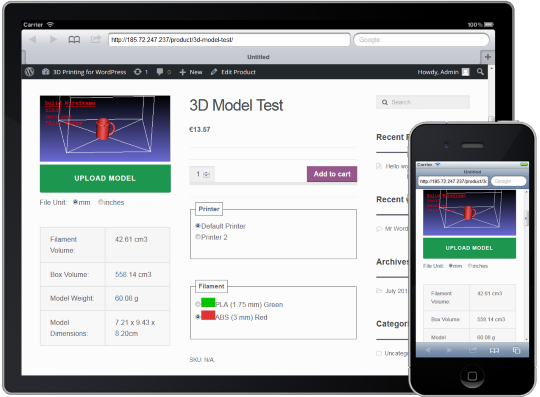 Wordpress 3D Printing product with enabled "Give an estimate and request price" option. 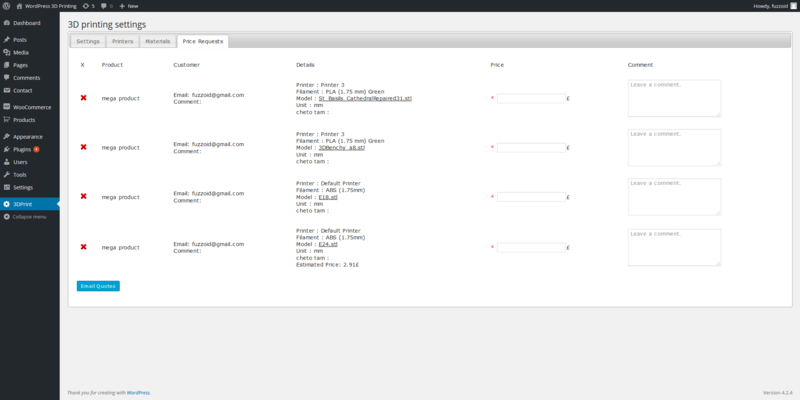 Wordpress 3D Printing Backend: main settings page. 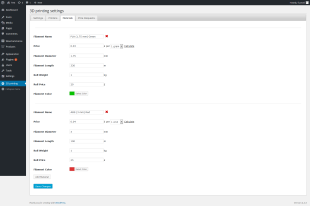 Wordpress 3D Printing Backend: printers settings page. Wordpress 3D Printing Backend: materials settings page. Wordpress 3D Printing Backend: price request manager. &dash;What do I get if I buy the plugin? Zip file with the plugin, free updates and free support. Free support is offered for one website. &dash;What do I get if I buy the subscription? 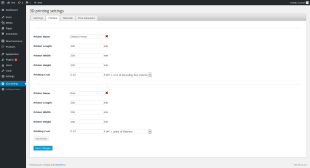 You can activate plugin's special features: infill, support material, print time calculation. &dash;How do I create a 3D printing product? In this video you can see how to set up a 3D printing product. &dash;What's the shortcode for the premium plugin? It has no own shortcode, but you can use woocommerce product_page shortcode. 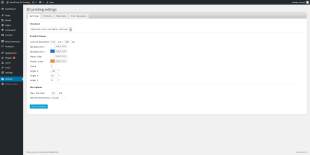 To be able to use it you need to check "Load Everywhere" on the plugin settings page. &dash;How is the printing price calculated? Generally the formula is: printing price = printer cost + material cost. Printer and material cost are calculated depending on the settings on the 3D Printing page. The cost can be calculated through material volume, weight or bounding box. &dash;How are infill, print time and support material calculated? They are calculated by Cura 3.4 running on a remote server. 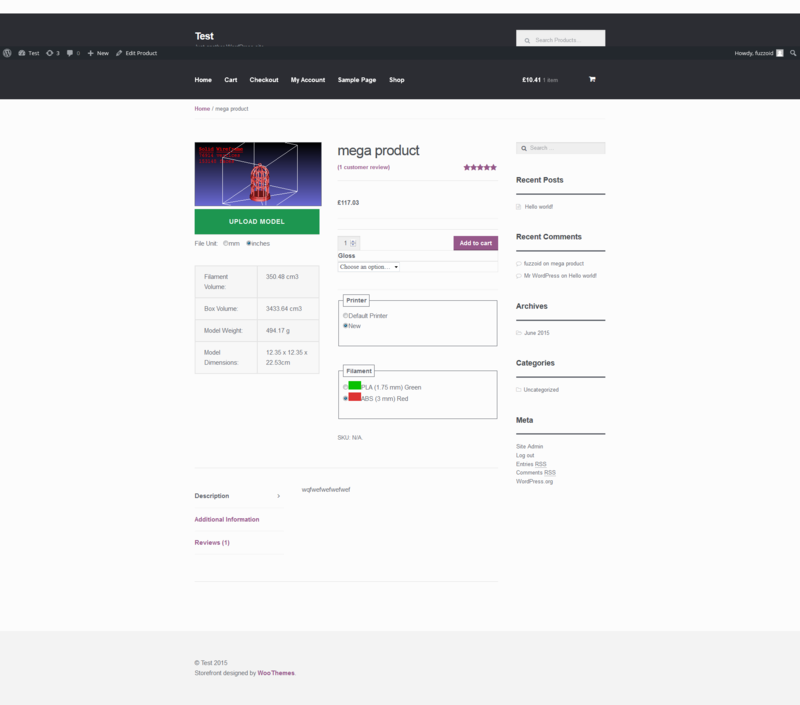 At the plugin backend you need to configure following parameters: layer height, wall thickness, nozzle size, infill %, print speed, travel speed, support material. &dash;How does the subscription work? The subscription is needed to enable infill and support material calculation. When you order a subscription you have an option to make it recurring. It can be cancelled or renewed any time. &dash;Can I get a trial period for the subscription? Yes, first 30 models are free by default. &dash;Does the plugin pass model's dimensions and weight to shipping modules? &dash;How do I set up a minimum price for small models? On the product page open Variations tab, expand the current variation and set "Regular Price". &dash;How do I set up different price rates for different amounts of material and volume? The price and amount are delimted by ":" symbol and price-amount pairs are delimited by ";". This works on printer, material and coating prices. &dash;Does the plugin check models for printability? The current version only checks if the model is larger than the selected printer build tray size. &dash;Can I add custom attributes with custom price? Yes, through the standard WooCommerce facility - http://docs.woothemes.com/document/variable-product/. Also you can set the attribute price on Products->Attributes page. The price can be flat or a percentage of the total, printing/material/coating price or material amount. It can also be a negative value. Video instructions on how to set up the price is here. &dash;How do I assign a printer/material to a product? By default all printers and materials are assigned to products marked as 3D Printing Product. At the attributes tab you can see "all" value against "Printer" and "Material". 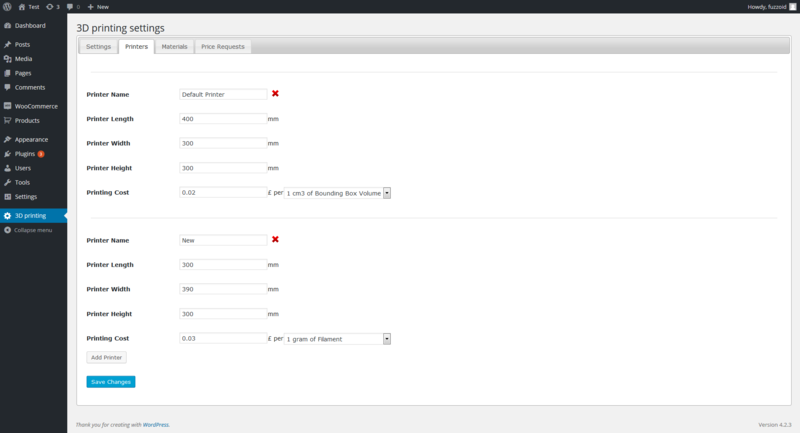 If you want to assign only one printer to a product - delete "all" and type the printer id in that field. 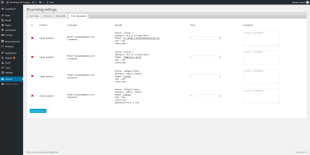 IDs can be seen at the Printers and Materials tabs of the plugin's settings page. Multiple ids should be delimited by "|" character, for instance 0|2|3. &dash;How do I group printers/materials/coatings? Give them the same Group Name. &dash;How do I sort printers/materials/coatings? Sort Order field determines the order, low numbers go first. Groups at the moment are sorted alphabetically. &dash;How do I add a predefined model to a product? Go to WooCommerce->Settings. Open "Products" tab. Click on "Downloadable products". Set "File Download Method" to "Redirect only"
Create a "3D printing product" by following installation instructions in the documentation. Open "Variations" tab. Expand the variation by clicking "Expand" link. There you will see "Predefined Model" field. Upload or select an existing file by clicking on "Choose file" button. &dash;How do I translate the plugin? &dash;I installed the script, but something is not working right.. Try to deactivate/activate the plugin. Try to uncheck "3D Printing Product" checkbox, save the product, again check "3D Printing Product" and save. Try to create a new product attribute on Products -> Attributes (this will reset the attribute cache). 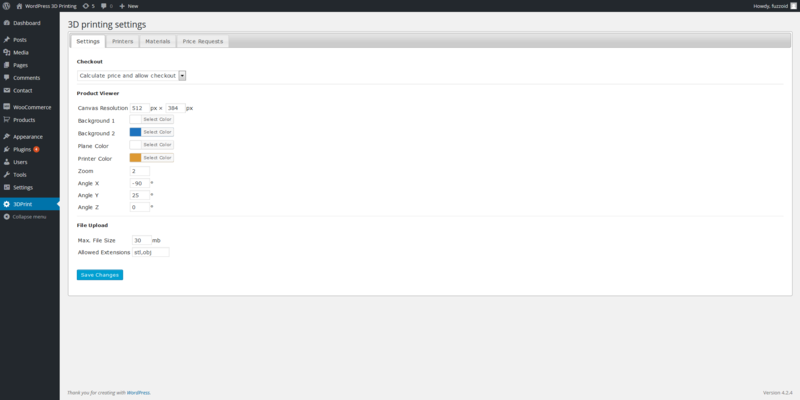 If you use any cache plugin on the site try to empty it's cache. Also try clearing your browser's cache. If that doesn't work feel free to contact me, I'll be happy to help.